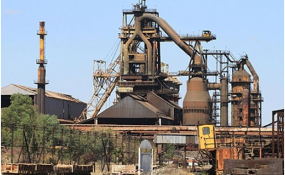 Lack of external infrastructure is the reason why Ajaokuta Steel Company is yet to start operations, the Minister of Mines and Steel Development, Abubakar Bawa Bwari, has said. The minister was speaking at a press briefing on the three years' accounts and stewardship of the ministry held in Abuja, yesterday. "Ajaokuta is 98% completed. Everything is in place and we have our workers there that are maintaining the place. The remaining two percent has to do with external infrastructure. We need waterways. We need viable ports and so on. Government is putting all these things in place now," he stated. He continued: "Even if it was completed 100% it would not be able to operate. If we are to bring in all the raw materials required from Itakpe, like the iron concentrate required, you need 750 trucks travelling each day to feed Ajaokuta. Imagine 750 trucks on Ajaokuta-Itakpe road daily. The road will be bad in one week. "So, what we have done is that we have completed the road link from Ajaokuta, Itakpe Warri ports. For Baro, it will soon be commissioned. We are trying to fix the infrastructure that will make Ajaokuta work," the minister said. He said many investors have indicated interest in taking over Ajaokuta, including investors who want to fix those infrastructure, adding "Ajaokuta will work." The said under President Muhammadu Buhari administration's strategic interventions from 2016, the mining sector has witnessed a steady rise in its contribution to the nation's GDP from 0.33% in 2015 to 0.6% in 2016. "Overall, the revenue generated by the ministry from royalties and fees has improved from N2.08 billion in 2015 to N3.92 billion in 2017 and N2.97 billion as at October 2018. Limestone mining has continued to lead in royalties earned by government," he added. He said within the period under review, the Mining Cadastre Office (MCO) has realized the sum of N5.2 billion as revenue generated through processing and other licensing fees.